These sushi bowls deliver a great, healthy lunch in just a few minutes. The trick is using your spiral slicer to get fun carrot and cucumber 'noodles' dressed in a mixed citrus ponzu sauce. The dish is accented with a spicy sriracha mayo. 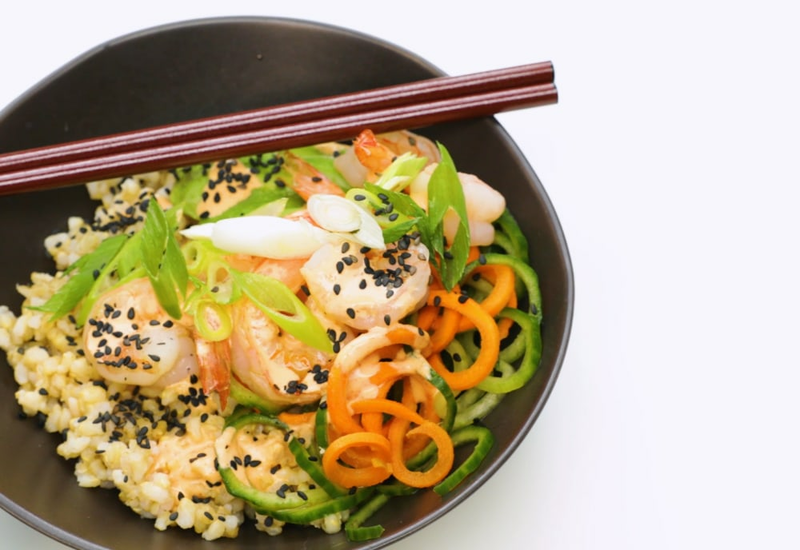 Each bowl is piled high with brown rice, shrimp, and avocado. Just before serving it is garnished with sliced green onion and black sesame for stunning presentation. Would you believe this elegant lunch will be ready to eat in just about 20 minutes? Incredible! Looking to make a vegetarian sushi bowl? Substitute tofu for the shrimp. It can even been vegan if you use vegan mayo! Per Serving: 1056 calories; 59g fat; 67.7g carbohydrates; 62g protein; 503mg cholesterol; 4786mg sodium. Such a tasty, easy recipe. I love the poke bowl trend and this was like shrimp poke bowls at home. Spiralizing is such a cool easy way to prep veggies without tons of chopping. I've tried a few different sushi bowls, but this one is by far my favorite. The ponzu and sriracha mayo tastes very authentic. The only thing I added to this bowl was sliced radishes because I had left overs in my fridge. Very good bowl, healthy, and light. Delicious recipe, but I did change a couple things. First, I cooked my rice ahead of time in my MultiPot and chilled it in the fridge prior to making this recipe. I also added ponzu to not only the spiralized cucumber and carrot, but to the rice too. Lastly, I skipped the shrimp to make it vegetarian. So easy, especially if you cook the rice ahead of time. Day old rice works best. I skipped the shrimp and added smoked salmon for more of a "sushi" vibe. I also used store bought sriracha mayo, because I had a brand new bottle in my pantry. I love the overall concept of this dish, it was delicious and the spiralizer saved me so much time from slicing and dicing.